Q. What is Springfield College Giving Day? Springfield College Giving Day is a 24-hour period where students, faculty, staff, alumni, parents and friends of the College come together in support of the College and each other. It's a day to celebrate all that makes Springfield's education in the Humanics tradition outstanding! Q. When is Springfield College Giving Day? 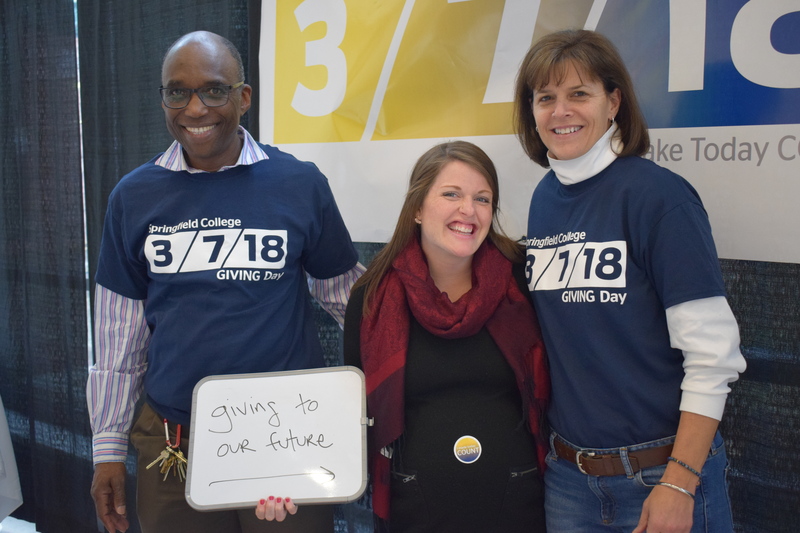 Giving Day is March 6-7, 2019 from noon to noon EST. Anyone may donate! We welcome gifts by students, parents, alumni, faculty, staff, and friends wishing to make a gift. made in person in the campus Flynn Union at the Giving Day table. Donations made online will be received and receipted by GiveGab. GiveGab is a nonprofit giving platform that helps nonprofits to raise money, engage donors and manage volunteers quickly and efficiently. GiveGab offers a full portfolio of simple and easy to use products that allows organizations to function in a more streamlined manner. Q. How will donations be distributed? Each donation made to a specific fund will be disbursed to that fund by Springfield College. Q. How much of my donation goes to the College? GiveGab retains a 3% campaign management fee from all donations, capped at $20 per donation. Credit Card processing fees are an additional 2.2% + $0.30 for all major credit cards (Visa, MasterCard, American Express, and Discover). You are given the option to cover the fees and if you choose this option, 100% of your online charitable gift will go to the receiving fund. All donations are final and cannot be refunded. Q. Who will receive my contact information? When you make a donation, Springfield College will have access to the information that is submitted. This information is used to send thank you messages, provide the option to receive future notifications, notify you of future activities, among other forms of outreach as determined by the college. Q. Do I need to create an account with GiveGab? No. You do not need to create an account to make a donation. The benefits of creating an account include having your tax receipts collected in one location, being able to track your donations, follow the charities you support, and engage in future volunteering and donations. Your tax receipt is emailed immediately upon processing your donation. To claim a donation as a deduction on U.S. taxes, you should retain the donation receipt as an official record. Q. Can I make donations via a mobile device? Yes! Simply visit https://givingday.springfield.edu/ on your mobile device.